Twenty-six profiles tell the story of the most celebrated military engagement in all of Texas history. 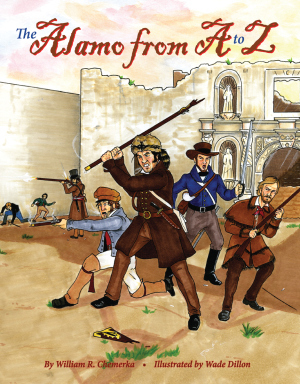 The action unfolds as M for Mexican Army and W for Women of the Alamo take their place in this tale of patriotic struggle. Although the battle was ultimately lost, it remained in the minds of Sam Houston’s army, spurring them on to win the Battle of San Jacinto and secure freedom for Texas. Descriptions of various historical figures highlight their significance as Alamo participants. These characters include the legendary David Crockett; Lt. Col. James Bowie, inventor of the Bowie knife; and William King, a fifteen-year-old boy who broke through enemy lines to join Alamo defenders. A timeline of events at the end gives a chronological look at this fateful battle. William R. Chemerka is an award-winning educator, writer, lecturer, historical interpreter, and actor. He established the Alamo Society in 1986 and is the publisher and editor of the Alamo Journal. He has been an on-camera consultant for six History Channel productions about his favorite topic in American history. Chemerka lives in Barnegat, New Jersey. Wade Dillon is a freelance illustrator and tour guide at the Alamo. He participates in reenactments of the event and considers himself an enthusiast. He has provided artwork for Knife World, the Alamo Journal, and the Crockett Chronicle. Dillon resides in San Antonio, Texas. Can't ever get enough Texas books! "Can't ever get enough Texas books around here."